Planning and preparing meals takes time. Sometimes paying for convenience is well worth it. However, you may want to consider how much you're willing to pay for convenience. For example, research has shown that restaurant foods are generally more expensive than foods bought as groceries: the cost per calorie is higher. It's not all about whether you eat out or not; it's also about purchasing foods that are prepared at the grocery store. Time pressures influence how we spend money. A study by USDA (Rahkovsky and Jo, June 2018) found that households where all adults were employed spent 10% less of their food budget on non-ready-to-eat foods compared to households where the primary shopper was not employed. Makes sense; when you lack time, then you may choose to pay for convenience. We all know that vegetables and fruit are healthy for us. However, is there a time when they're healthy for our budget too? When produce is in season locally, it is much easier to find good buys. In addition, freshly picked fruits and vegetables have more flavor and you help boost our local economy by supporting local agriculture. Sometimes frozen or canned produce are less expensive, especially in the winter months. You can explore the cost of a cup of edible produce using a fascinating interactive chart from USDA, and compare when it's better to buy fresh, frozen or canned. Of course, prices will vary by location and season. Our local farmers' markets have lots of fresh produce at this time of the year. You can talk to the people who grow the produce and learn more about their produce, and how to prepare it. Many farmers' markets accept a LINK card for payment. In some communities, the farmers' market may have special programs that give you extra tokens when you use a LINK card. You can also use WIC vouchers and Senior Farmers' Market coupons at many farmers' markets. Whether you buy your produce at a grocery store, a farmers' market, or somewhere else, keep in mind that produce in season is likely to be a better buy than produce that is out of season. 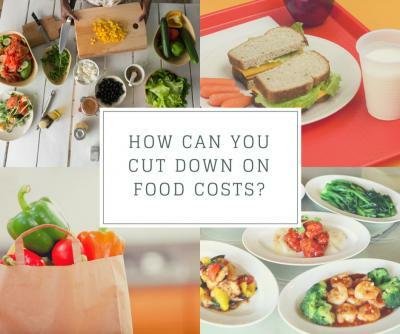 Does it really matter if we manage our food costs? Individuals typically spend about 12% of their average annual expenditures on food, according to the Consumer Expenditure Survey. About 50% of people's food dollars are spent on food away from home. (Although, households with lower incomes tend to spend a higher percentage of their incomes on food costs overall.) If you're looking for ways to stretch your dollars, examining how you spend your food dollars may help. What strategies do you use to keep your food costs down? Some people are using phone apps to make their shopping lists, compare food prices, and find coupons. Do you have a favorite app? I'd like to hear about it!